We've all been there. It's the day of your flight and you find yourself rushing around the house throwing one item after another into your bag. "Did I pack my phone charger? What about a jacket?" The last thing on your mind is checking in to your flight — or at least you don't remember to check in until you're in a chaotic rush to get out the door. Now you can check in to your flight hands-free with your favorite smart device such as Amazon's Alexa, Google Assistant via your phone or Google Home and through Fitbit's Ionic smartwatch making it even easier to gather up those last-minute items. Amazon Alexa, the voice service that powers Echo, provides capabilities also known as skills, which enable a user to interact with devices throughout their home through voice commands. Using your Alexa-enabled device such as the Amazon Echo or Amazon Echo Dot, you can also check your flight status and ask about the amenities on board, including Wi-Fi, movies and entertainment using the simple command, "Alexa, ask United…"
"Every day we connect nearly 400,000 customers to business meetings, loved ones and new adventures," said Praveen Sharma, vice president of digital products and analytics at United. "Introducing the new skill to check in and receive flight information with Alexa is an innovation that gives our customers extra time to prep for a business meeting, play with their children or relax as they get ready for their upcoming flight." The United skill for Alexa launched in September in the Amazon Alexa app. Once you've enabled the skill on your device, connect your MileagePlus® account which will activate the skill. From there you can check in for your U.S. domestic flight using the command, "Alexa, ask United to check me in." Get the United skill for Amazon Alexa here: https://www.amazon.com/dp/B0725H6LG7. Additionally, you can now check-in using Google Assistant through your phone or Google Home device and coming later this month through the Fitbit Ionic smartwatch. The new United app on the Google Assistant lets customers use smart speakers like Google Home, and eligible Android and iPhone devices to stay up-to-date on their flight. Once customers have linked their MileagePlus account to the Google Assistant, users can say "talk to United" to hear their flight status, check amenities and check in for their upcoming flight. The new app also allows Google Assistant users to check their MileagePlus account balances, hear their last account activity, check in for their United domestic U.S. flights and hear flight information. And lastly, Fitbit announced additions to its App Gallery that allows owners of the Ionic smartwatch to choose from more than 60 apps and 100+ clock faces to personalize their watch. The United app will allow customers to receive flight status information and their boarding pass on the device with no need to pull out their phone. 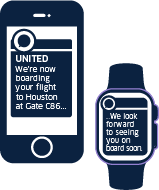 To access the United app on the Ionic smartwatch, customers can connect their MileagePlus account in the United app settings within the Fitbit mobile app, and sync Ionic to update the watch.